The hero of David Rothkopf’s book is not an individual but a Swedish company, Stora, reportedly the oldest surviving corporation in the world. Founded in the 13th century to exploit a rich copper deposit, it is today a leading manufacturer of pulp and paper products. Rothkopf, a former member of the Clinton administration, argued in his previous book Superclass that a global elite of 6,000 people – Davos men – run the world without regard to any national allegiance. 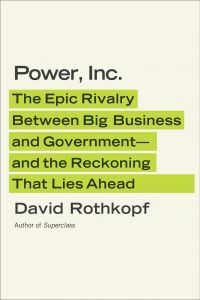 In Power, Inc he claims, with extensive historical reference, that large corporations have achieved similar power and autonomy. The corporation is the most important of today’s economic institutions; without it, we could not contemplate the scale and complexity of the modern economy. The largest modern corporations have resources far greater than any individual. The essence of the corporation, epitomised by Stora, is an entity with an existence of its own that will survive its original founders, and their associates and relatives. As Stora illustrates, the corporation may long outlive its original purpose. 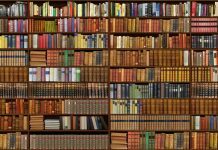 The notion that the corporation has its own distinct legal personality is closely associated with, though not identical to, the concept of limited liability. The corporation itself, and no particular individual, is responsible for its debts. Yet as Rothkopf explains, both limited liability and legal personality are dangerous concepts. Does legal personality confer on corporations the rights that individuals enjoy? What responsibilities are associated with those rights? The South Sea Bubble provided an early demonstration of the possible adverse consequences of limited liability. Greedy or incompetent individuals could exploit the privilege to privatise gains and socialise losses. The bubble led to a general prohibition of the practice for more than a century. When the ban was repealed, the experience would be repeated. But how far does legal personality extend? In its 2010 Citizens United ruling, the US Supreme Court declared that corporations not only had the same right of free speech as individuals but that any restriction on their ability to use their funds to advance that right was an unconstitutional restraint. British law and practice struggle to define a concept of corporate manslaughter. An American judge asks what public purpose is served when corporations bargain with public authorities to settle claims of alleged wrongdoing without acknowledgement of fault. The troubling issue in each case is the validity of the analogy between the individual and the corporation. Rothkopf raises these issues but does not focus sufficiently on them, rehearsing instead a litany of familiar observations. The turnover of the world’s largest corporations exceeds the gross domestic product of all but the largest states. Big companies spend too much on lobbying, have inappropriate political influence, and use that influence to emasculate regulation or render it ineffective. Multinational companies use aggressive tax planning to minimise the amounts of tax they pay. And this leads him to the equally familiar recommendations of more regulation and global governance, with little detail of how such oversight would be exercised and the objectives it might achieve. The concept of corporate personality is a powerful metaphor. But it is a mistake to turn a metaphor into a doctrine. The legal concept of corporate personality serves the critical economic purpose of establishing that binding contracts can be made in the name of a company. That principle, however, should not be extended into the claim that the rights of the corporation are essentially identical to the rights of individuals conferred on individuals. This applies all the more if, as in the US, these individual rights were defined by a constitution erected when corporations were an insignificant part of the economic landscape; or, as in Europe, are based on a Convention on Human Rights written with entirely different purposes in mind. Neither of these documents yields a rational basis for delivering the relationships between the corporation and the governments of the states in which it operates. The fundamental rights of the individual are to exist, to make decisions within an appropriate sphere of autonomy, and to take part in the political processes of an open and democratic society. These entitlements do not have corporate analogues. The corporation has no necessary right to exist. As Rothkopf notes, through most of history corporations in their modern form were not permitted to exist, or had come into being only as a product of the grant of specific privilege. We did not change our minds because we perceived a deficiency in the moral stance of previous generations. We saw rather that modern technologies had brought about a change in the balance of economic advantage. As Rothkopf explains, modern law facilitates the creation and operation of corporations because – and only to the extent that – they serve our collective as well as our individual needs and aspirations. The privileges such entities enjoy should be framed with the primary objective of helping them to meet these needs. 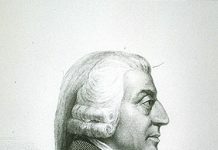 Is there more to Adam Smith than free markets?